How many of us turn to literature for help during tragic times? The events of 9-11 nine years ago held many of us New Yorkers in a nightmare where our notions of reality were threatened. How did we get through it? For me, I turned to The Lord of The Rings Trilogy by J.R.R. Tolkein, Phillip Pullman's His Dark Materials and A Wrinkle in Time by my grandmother, Madeleine L'Engle. Yesterday I finished reading Mockingjay by Suzanne Collins, a surprising tribute this time of year. The battle between good and evil and the utter uncomprehension war brings. The old trope of absolute power corrupting absolutely. September 11th, 2001. I was half watching the Today Show as I was trying to get my toddler ready for the park when it happened. 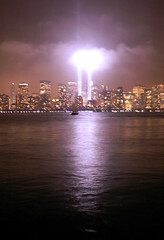 It didn't register: the burning towers, the second plane crashing in. It couldn't be happening. I walked Cooper to the park, a beautiful, sunny, September morning, meeting with other parents. "Did two planes really just crash into the World Trade Center?" All parents were walking around in slow motion, cell phones to their ears. We were talking to each other, talking to the air. "How could two planes have malfunctioned?" "Maybe it was terrorists." "What?" "Doesn't your wife work down there?" "I have to go home, see what's happening." This was our city's downtown, up in flames. My brother could see it from his rooftop on 14th Street. I used to work downtown as a counselor at a high school right across the street from the World Trade Center. The kids had just started school again. Were they all right? I had other friends who worked down there . . .
For the next week, I was glued to CNN whenever my son was sleeping. Us New Yorkers were in a collective nightmare. Even on the Upper West Side we could smell the rampage of our city. And we were helpless. It wrenched my heart, broke me down. It was unthinkable . . . So I read, to seek understanding for why human beings do terrible things, for hope, to be able to fall in-love with humanity again. I watched friends move out of the city, quit their jobs, reevaluate what's important. Change their lives. I enrolled in a Seminary to become an Interfaith minister, but I realized that I could serve humanity better by taking myself seriously as a writer. I helped take care of my grandmother, had two more babies and I wrote. Edges at first was a book written with the backdrop of 9-11. It was wrong, and overshadowed the other things I was trying to say, but my psyche was working overtime. I was able to take it out after a while as my faith came back through other stories of strength and resilience. Faith can slip away so easily, but sometimes it is the realest, truest thing I have. Frodo has to destroy that ring, Lyra has to get captured in order to rescue, and Meg has to find the double edge of her faults to save Charles Wallace and her father. And I have to read and write, in order to find Truth. Books are therapy for me, too. I lost myself at Hogwarts while my son was going through his autism diagnosis. I'd read the first book a year or so before and thought "yeah, it's okay. Does't do much for me." Decided to give Harry Potter another go during my turmoil and became completely absorbed, reading the first four books in about a week. 9/11 was in the middle of that time period so it's a blur to me. Love the picture you used--I've never seen anything like it. Hogwarts, yes! Thank you for mentioning it - I'm in the middle of re-reading again - and of course I was reading them around that time, but it was Tolkein, Pullman and L'Engle for those few months directly afterward. The lord of the rings series are so amazing. I can totally see how they were helpful for you during that difficult time. I just starting a wrinkle in time again...as usual I am struck by megs journey...I kind of feel like I am going through that now in 20s. Coming to terms with myself...gaining confidence in who I am as a flawed human being. Thank you for your comment, Pina. The journey to self-acceptance is one we take over and over again, isn't it? I like to read your books to get information abut cv writing services because i like literary novels and books. You always give me special knowledge regarding literary.